Throughout his career, Houdini performed three variations on a "Buried Alive" stunt/escape. The first was near Santa Ana, California in 1917, and it almost cost Houdini his life. Houdini was buried, without a casket, in a pit of earth six feet deep. He became exhausted and panicky trying to dig his way to the surface and called for help. When his hand finally broke the surface, he fell unconscious and had to be pulled from the grave by his assistants. Houdini wrote in his diary that the escape was "very dangerous" and that "the weight of the earth is killing." Houdini's second variation on Buried Alive was an endurance test designed to expose mystical Egyptian performer, Rahman Bey, who claimed to use supernatural powers to remain in a sealed casket for an hour. Houdini bettered Bey on August 5, 1926, by remaining in a sealed casket submerged in the swimming pool of New York's Hotel Shelton for one hour and a half. Houdini claimed he did not use any trickery or supernatural powers to accomplish this feat, just controlled breathing. Houdini repeated the feat at the YMCA in Worcester MA on September 28, 1926, this time remaining sealed for one hour and eleven minutes. Houdini's final Buried Alive was an elaborate stage escape that was to feature in his full evening show. 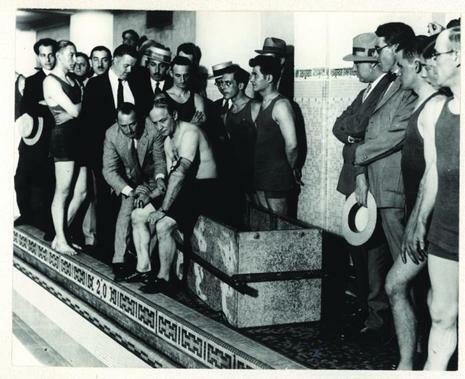 The stunt would see Houdini escape after being strapped in a strait-jacket, sealed in a casket, and then buried in a large tank filled with sand. While there are posters advertising the escape (playing off the Bey challenge they boasted "Egyptian Fakirs Outdone! "), it is unclear whether Houdini ever performed Buried Alive on stage. The stunt was to be the feature escape of his 1927 season, but Houdini died in October 1926. The bronze casket Houdini created for Buried Alive was used to transport Houdini's body from Detroit back to New York following his death on Halloween.